If you’re a frequent user of the Command Prompt in Windows, you’re in for a shock. After more than a decade, Microsoft has updated the functionality of the Control Panel with the one feature – and more – that users have been asking for: CTRL + C capability. For those unfamiliar with the Control Panel, you can’t just cut and paste command in it. Until now, until Windows 10 was released. If you right-click on the Start Button, then click “Command Prompt,” you can open it. We always recommend you open the Command Prompt as an Admin for maximum functionality. You can also search for the Command Prompt in the Start Menu, whichever you prefer. Once open, right-click anywhere in the title bar. You’ll notice a new menu, including the options for Edit, Defaults, and Properties. 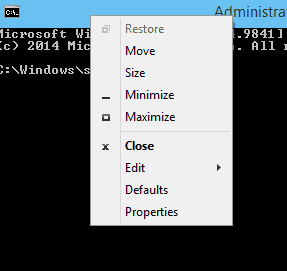 We bet you never thought you’d see the day the Command Prompt had actual settings, did you? 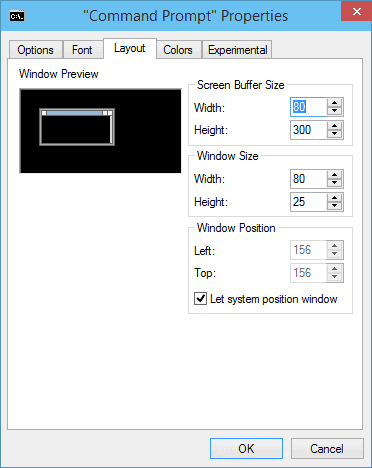 The Options settings allow you to change some cosmetic features, like cursor size. 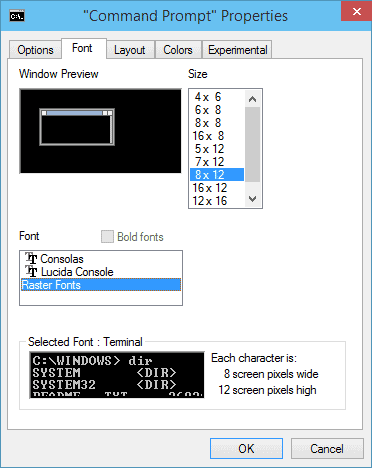 The Font settings allow you to change the size of the window and the font, making the Command Prompt more visually appealing. 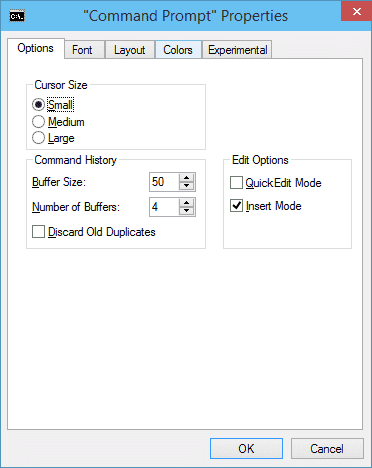 The Layout settings allow you to change the size of the Command Prompt when you open it, making it more functional for whatever you might be doing. 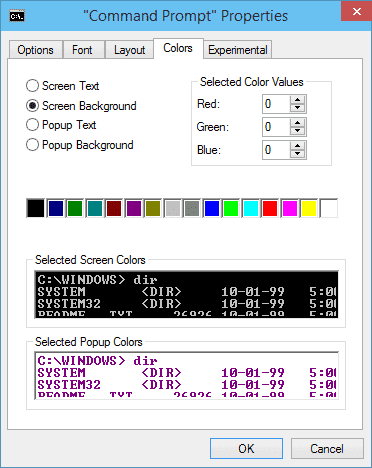 The Colors settings allow you to change the color scheme of the Command Prompt, again, making it more visually appealing when in use. 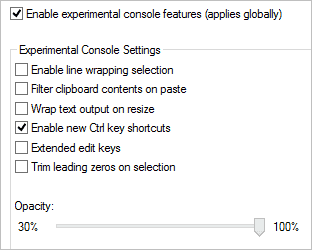 Finally, the Experimental settings allow you to change some of the functionality of the Command Prompt, including turning on CTRL + C, and other CTRL features, on. 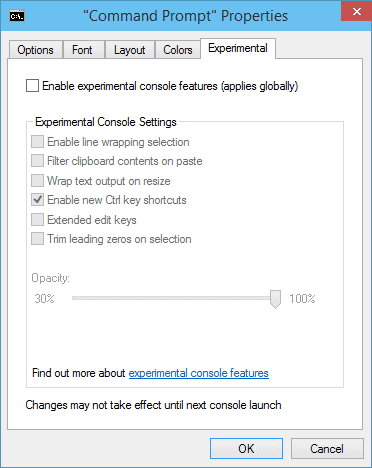 Click “Enable experimental console features (applies globally)” to get started. Make sure to check “Enable new CTRL key shortcuts” to use CTRL + C and other features. Keep in mind that turning on the experimental features can make the Control Prompt buggy, especially when test driving Windows 10. You’ve been warned. We’ve covered the new keyboard shortcuts in Windows 10 here, along with Scott Hanselman’s discovery of the new Command Prompt shortcuts. 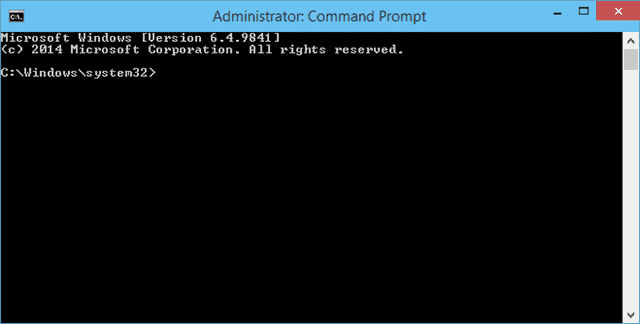 You can read his full blog post here to get the most from the Command Prompt in Windows 10. Other than the experimental features, the Command Prompt works just like it always have for the past decade. It’s not buggy when the experimental features are turned off, but once you turn them off, you may find commands and other issues with freezing Explorer, then resetting it. 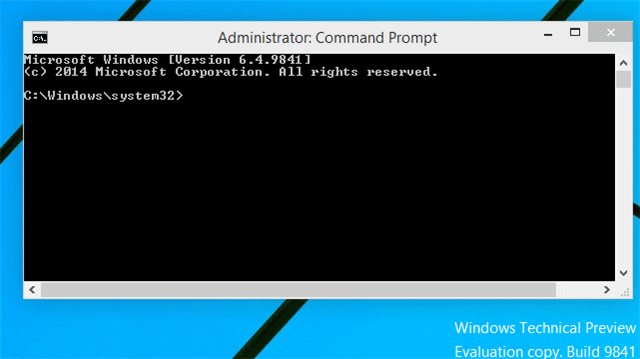 The changes to Command Prompt in Windows 10 are exciting and needed. For those of us who use it in Windows, we’ve been wanting CTRL + C functionality for years. Now that it, along with the other included keyboard shortcuts, the Command Prompt is like a brand new toy for Windows users to tinker around with.